Great news to my Singapore friends, I will be back there on April 27 to conduct 2 personal finance seminars! This is the 4th year that I am running a program in Singapore and I am so blessed to see how personal finance seminars have helped improved the financial lives of our OFWs based in Singapore. 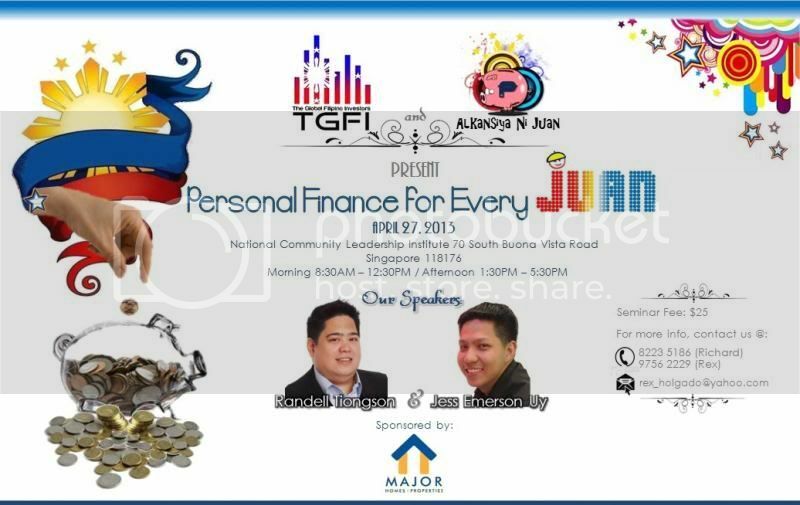 I will be joined by my friend Mr. Jess Uy, a Filipino Investment Adviser based in Singapore for the said events. I am excited to talk about achieving financial peace through a process I will outline in the seminars. There will be 1 session in the morning and another in the afternoon but seats are limited so it is best to register as soon as you can. All the details can be found in the e-poster below or you may send an email to [email protected] or [email protected] for your inquiries. Shared this on my Facebook wall. More Financial event this year, Sir Randell. The 2018 Christmas Book Promo! Can the Philippines go cash-lite? I’m 22, when do I start preparing for retirement?